World Stroke Day & Give A Hand Week – are you getting involved? In the UK somebody has a stroke every five minutes making it the third most common cause of death. Despite this, many people don’t know the warning signs or risk factors of a stroke. October is an important month in raising awareness, and also highlighting stroke prevention and treatments. In addition to tomorrow’s World Stroke Day, The Stroke Association is currently running Give A Hand Week in which supporters are encouraged to raise money by doing a regular activity, but with their non-dominant hand. At Inhealthcare we will be drinking our brews and decorating cakes with our other hand. We will also be holding a bake sale and all donations will be going to The Stroke Association. What will you being doing to show your support? We know that stroke prevention pathways are high up on the NHS ‘s agenda, and we are keen to see patient care being enhanced in this area. As the most common oral anticoagulant in the UK, warfarin therapy is a common medicine used to prevent blood clotting, and reduce stroke risk. This method of stroke prevention often requires careful monitoring, meaning many trips to the clinic for patients. 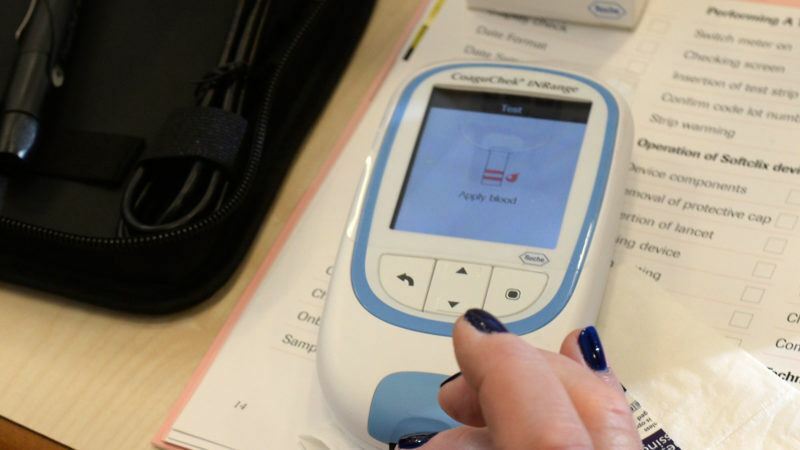 However, NICE recommends self-monitoring for people on long-term anticoagulation therapy, and supports the use of Coaguchek devices developed by Roche. These devices enable warfarin patients to remotely test and monitor their INR readings (rate at which the blood clots). Self-testing can enhance a patient’s freedom, particularly if they work, holiday abroad, rely on transportation or are at a distance from the nearest clinic. INR can be easily checked in worrying situations including starting a new medication or making dietary changes. Regular monitoring means health professional can easily recognise adversities, and act quickly. Self-testing empowers the patient by being actively involved with their own care.